Info "These puppies want to give you five, so give them a hand! 2005: Nintendogs / Nintendo DS"
Nintendogs is a microgame found in WarioWare: Smooth Moves in 9-Volt or 18-Volt's stage. It is set in the Nintendo DS game of the same name. 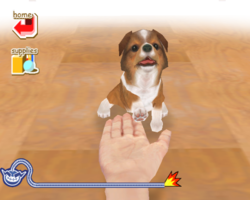 The objective is to high-five the Nintendog(s) by moving the Wii Remote left and right as the pup(s) try to high-five the onscreen hand. Level 1: High-five one dog. Level 2: High-five two dogs. Level 3: High-five two dogs, but one will make a fake high-five. This page was last edited on August 21, 2018, at 00:36.